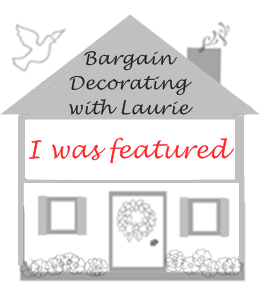 BARGAIN DECORATING WITH LAURIE: FROGS, FLOWERS, EASTER EGGS & NO COMPUTER! FROGS, FLOWERS, EASTER EGGS & NO COMPUTER! 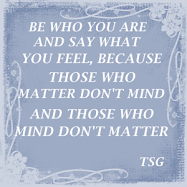 (Yes, I did say something worse than this on Saturday, but I can't say that here, because I have a "G" rated blog)! 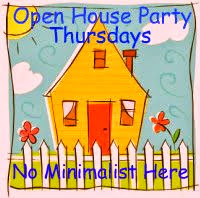 I had a post ready for the chocolate cookie outdoor party at The House in the Roses, but my internet service went down. I've become so addicted to reading your blogs, I drove everyone around me crazy while my computer was down. I laid awake at night, worrying that people in white lab coats were coming to strap me down and take me away, because my family had decided I needed help. My family was relieved when we got our computer service back, because I was really on edge with them when I was unable to go to Blogville (I even accused them of intentionally doing something to my internet connection!). I tried to explain to them that I was on edge because of the way they were acting. They didn't buy it though. That's when I started telling them that there is a whole world of bloggers out there who would react the same way I was reacting. They started rolling their eyes at each other when I said that! Can you believe that? Can you believe they rolled their eyes at me? Can you believe they think I'm crazy? Can you believe that my family doesn't understand the importance of me being able to check your blogs? Actually, I can't believe how crazy I was without my computer! So, now you know why there are chocolate cookies in my Outdoor Wednesday post! 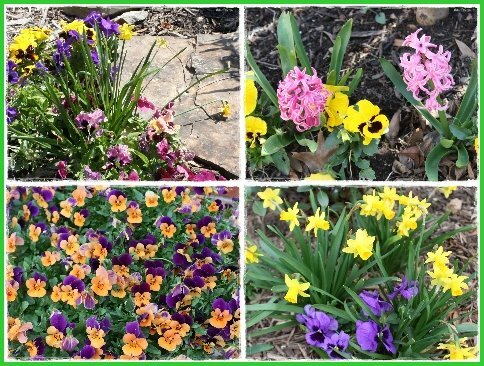 I'm so glad that Susan at A Southern Daydreamer hosts Outdoor Wednesday, so I have another chance to use the pictures I took of the cookies before I ate them! After all, if I'm going to make myself wait until after I take pictures to eat chocolate cookies, those pictures are definitely going to be used on my blog! Okay, you're right. I need to take a deep breath and just get over this computer frenzy! Let's stop and smell the flowers. I've got the Easter eggs all ready for the Easter bunny. While I wait, I'm going to have some lemonade and chocolate cookies. Can you tell that when my internet service was down, I played with Photoscape? (I just had to get my fingers on that keyboard for a little while). We'd better hurry. It looks like the frogs are going to get the cookies before we get there! The last time I posted a picture of this frog pitcher, somebody said he looked like he was going to the bathroom. Now I laugh every time I see him, because he really does, and I'd never noticed it before! I'm serving lemonade, so I hope the pitcher doesn't spring a leak, or it will really look like he's going to the bathroom-all over my tablecloth! Please sit down and join me for a cookie and some lemonade. 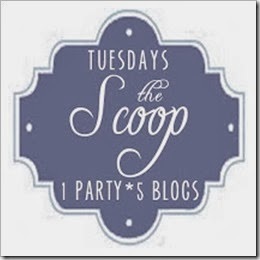 Did you really think you were going to get away with a post that short on my blog? I just HAVE to show you what I got! 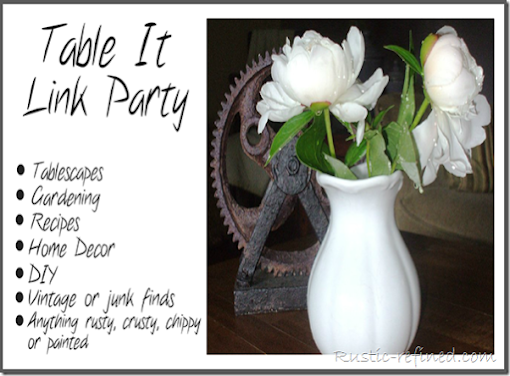 You've probably seen this wonderful plate over at Ask Kari and Kijsa Blog. If you haven't you need to get over there and take a look in their Etsy Shop while you're there. But you haven't seen it on the mantel in my black and white bedroom! When I saw these plates in their store, I knew I had to buy one. The hard part was deciding which one to buy. Since I have a daughter and a son, and the daughter is the older of the two, I decided I'd order this one. Isn't it pretty? I was so excited about getting it. And packaged with my order were these really great note cards! Thanks girls! Just one more thing on this post, I promise! The other disaster about my internet connection being down is that I, a LOVER of all things toile, missed the toile party!! 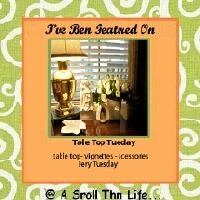 I am SO disappointed to have missed it that I am going to refer you to my toile posting that was one of my first postings on my blog!! (Now remember, this takes a lot of nerve, because hopefully, I've grown a lot in my blogging abilities since then, but toile is THAT important to me!) So, if you want to visit my toile, please click here. Gosh Laurie, I did notice you hadn't posted for a few days....and....well after the discussion about giving passwords to our families to let our internet friends know what was going on. I was sure you wouldn't leave us hanging....LOL Im thinking maybe your family would though. I read and laughed through every word of your new post. I get the eye roll too. 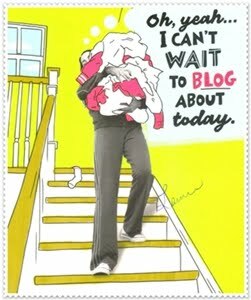 I would rather tell my husband I'm sneaking off to meet a man then tell him I went to check out new blog posts. I love your gardenscape. Welcome home dear. Girl, I know exactly what you are talking about. I also went into a panic when my computer went down! I love the orange and purple pansies. They are so cheerful. my family may need to do an intervention one day...but until that day...I am glad you are back!!! I know how you felt...I panic when not all is well with my computer! Laurie!! You just crack me up!!! I couldn't stop giggling while I was reading your post! But I kind of have to agree about the "going crazy not being able to post" part of your comments! I have been so busy these past few days...I was getting so antsy to get back to blogging! Anyway...my Girl Scout cookies didn't last long either!! LOL! Also, loved that cute froggy! So glad that you are "hooked up" again... we missed ya. Well, darling, I'd love to sit outside by the pool and have me a box.. er...a couple... of those GS cookies! Everything looks springy and happy! Nothing like being "without" -- it drives us crazy too! Would love to share your lemonade and cookies -- what a delightful setting. So glad you're back! Love your froggie pitcher and I did peak at your toile! I fall into the "love it"!!! category. Im sorry to hear your net was down,but it was so refreshing to come visit this morning. So beautiful! i LOVE your yard..is that a pool? you lucky duck. that frog pitcher if i was there would somehow be missing. he's so cute! Our screen room, yeah you just purchase them at any store--around here--Shopko, Walmart-Menards-etc. I think Menards might only be in Wisconsin though. Lowes, Home Depot all should have them. They are big around here because of our moody climate. They are pretty sturdy-last night we had winds of 60 miles per hour and its still up. We screw ours into the deck and also have many tie downs. Each season I have repairs to make and we also waterproof it. I think I paid about 250 for this one. Next one i get is going to have shelves in the corners for outdoor knick knacks! Good morning Laurie...well, now that you're back all is normal again in Blogville! It just isn't right without you here...I did go back to your toile post & ol' Charles Faudree doesn't have a thing on you...your bedroom is GORGEOUS! and so are your outdoor photos today...Big smiles to you!! Your outdoor party looks so refreshing. Love the collages!! Welcome back to the land of cyberspace! Laurie, don't worry, I totally understand! I'd be cranky too if I can't post when I need to! Lovely backyard you have and that plate is simply gorgeous! Where do I begin?!! I love all of your photos! It really puts me in the mood for Spring! Thanks for sharing! What a fun filled post! Just breathe in .... breathe out.... and your computer is fixed and all is fine again! I certainly know what you mean when there are computer problems. whew. There is a WHOLE world "inside" the computer and those guys should not have rolled their eyes at you! Mmmmmmmm, Dr. Helen thinks you have gone a tad bit too far with this internet/blog fascination syndrome. However, you wouldn't be the Laurie we have come to know and love without it .... so, you go girl! It is a horrible feeling not being able to read our blogging friend's blogs, isn't? Glad you are back up and posting!! Oh I adore what you did on your patio. The colors are fantastic. The plate on your mantle is so pretty. 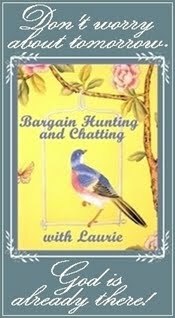 It is so great to know you are back among the blogger's, Laurie!! I've forgotten half of what I wanted to say because I had so much to read! Tell your eye-rolling family that I'd go nuts too without my computer friends to talk to. I like your apothecary jar filled with the bright eggs. You cook like I do. I use the same Girl Scout recipe for cookies! I'd feel the same way if my internet was down! 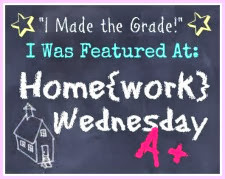 This blogging has become such a big part of my life since I've retired from teaching. It's a good replacement for creating lesson plans. Besides that I've met so many wonderful new friends like you! This is so funny, I feel as though you have just described me when something goes wrong with my computer, and I get the same reaction from my loved ones who are after all called loved ones because they care right? lol I so enjoyed your blog. Laurie you are hysterically funny girl! White lab coats...the frog going to the bathroom on the table. HAHA! Love this post and your new plate is beautiful. Happy OW Laurie, you are so funny, I really enjoyed this post, your cookies, lemonade, eggs, bunnies and flowers, well everything really. Kathy. Say, I'd like a girl scout cookie and some lemonade. Do you have any left? Hi Laurie, I thought that plate looked familiar! It looks so pretty on the mantel. There was a lot of toile to see at the party! I never realized how many people really love it! it looks beautiful! We are so glad you are up and running...we went three weeks without internet during the ice storm and were about to have a fit!! And have to laugh about the family comments too!! The plate looks amazing...and we were so excited to hear that it reminds you of your very own family- a big compliment in our books! Love all your tablescape fun too! Welcome back!! 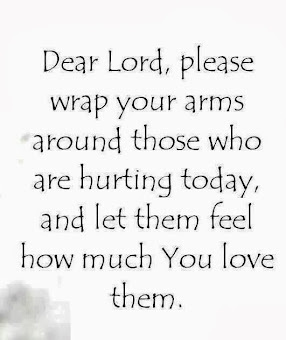 YOU ARE A VERY DEAR, COMPASSIONATE, FUNNY LADY AND I KNOW YOU ARE NOT ONLY PRAYING FOR AMY AND LEILA BUT YOU HAVE A WHOLE LIST OF PEOPLE. OKLAHOMA DOES HAVE CRAZY WEATHER. first ALL posts should start with chocolate cookies... there, i said it! second i so get the no net, OY talk about living on the edge! fun pics and glad you are reconnected, you know you can always hit the library next time! 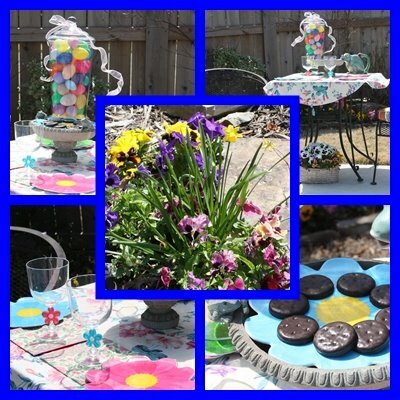 I just love that Easter bistro set by the pool! I wish it were that warm where I am at! 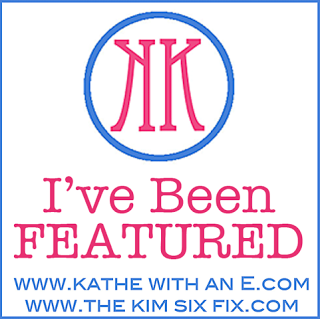 I just found your blog and it's very nice to meet you! I added you to my blogroll. Laurie, I am still laughing over that frog. I know how you feel when you don't have your computer working; it's like not having a car and you have money in your wallet and can't spend it! Gosh! Love you nook for two tablescape. And the colors are springy! I love the plate! I love the frogs, flower stemware, and plate. I was thinking, wonder if those are mint chocolate cookies, Yes they were! I love them. Thank you for joining me on my Birthday with a Tea Party! I was so sick yesterday,feeling better today. So I have no Post done! I was gone all day Tuesday! Give out! But Yes I am home and have gotten the first good new in SIX YEARS! I need to go do a post on it. Love the flowers and the pool! Thank you for stoppin' on over to MLHP, and for signing up as a "follower!" Your blog is so festive and fun, I feel like I need to get with the program and get some Easter things put out..if only I could find them in all our packed-away stuff! Well, I'll take cookies and lemonade today, or any other day. Love the little tablescape! Glad your computer service is up again! I get the eye rolls ALOT around my house too! That's ok, they just don't know what they're missing! I am so sorry I missed the tea party☺ Sorry you were without internet but I'm glad you are up and going again! Hi Laurie, I am a little behind with commenting...sorry. Your tablescape is lovely...I want the little rabbit with the writing on her skirt...your backyard looks so inviting, and please pass those cookies. I have a "frog" that needs a few!!!! You know that I know where you were with no internet. I honestly thought the world had come to an end. I would try endlessly to make it work. I played solitaire on here. I went to McD's and the Library. Believe me, it's not comfortable using a laptop in the car...and Boudreaux was with me. Love Girl Scout thin mints. I was a Girl Scout for years and years!